Today is my birthday. The only thing I wanted for my birthday is not to wake up to news of more dead soldiers. Thank God for that small relief. I suppose that it is weird open your eyes in the morning and before doing anything else – turn on the news. I don’t think people do that in normal countries. That is how I have started the day for years. In Israel things change so fast that it is crucial to know what is going on. Now we are in the midst of a war (it’s still being called an “operation” but in reality this is a war). Now the airwaves are bringing us news of life and death for the people we love, destruction or the “near miss” miracles for places that matter most to us. Every day, for the past few days, I have woken up to news that makes me scream inside my head. It begins before the information is actually conveyed. The person reading the news sighs. Or makes a face, closing his or her eyes before saying the words. Or begins to say: “We have now been given permission to say that…” Any of these are enough to set off the screams in my mind: “No! Please no!” I get a twisted feeling inside. Who will it be? How bad is? 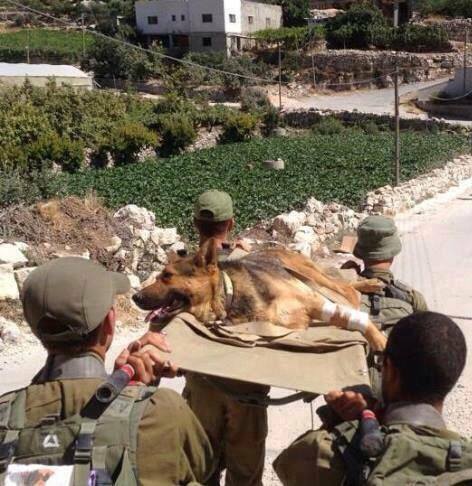 Thank you to the IDF soldiers defending the Nation of Israel and their four legged friends. May you all come home safe. I am sure many others in the country have the same exact reaction. It’s not something people talk about. Israelis are tough. When horrifying things happen Israelis tend to downplay, to understate: “It wasn’t simple (to see my friends explode in front of me).” Israelis don’t go in to hysterics, scream and cry. They do what needs to be done. But that doesn’t mean they don’t fall apart later, when no one is looking. Or scream inside their head. This morning there was no news of soldiers killed in the night. Thank God. Instead the news detailed the timings of the funerals for the soldiers killed the day before. A small relief. I don’t want birthday presents. I want the world to see what is happening. To wake up. The Israel Defense Force was created to defend Israel – defend, not attack. Our army never goes enthusiastically to any battle. The price is too high. On the other hand, when we are attacked and given no choice, our defense is that of the lioness protecting her cubs. Other people fight wars “over there”, for political interest. We are fighting to protect our homes, our children and our future. The threat is raining down from the sky and bursting though the ground in our backyards. It must be stopped. My deep thanks go to all the defenders of Israel. To our soldiers and those who help protect and support us in other ways. You are all important. May our soldiers be protected as they strive to protect us. May the wounded be healed – swiftly and completely. May the grieving find comfort, peace of mind and heart. May the silent screams be replaced with shouts of joy.